In the recent Global NCAP crash test, the Renault Lodgy scored zero stars for adult occupant protection, and an average two-star rating for child safety in the rear seat. The Renault Lodgy MPV has scored a very poor zero star rating in a recently conducted crash test by the Global NCAP (new car assessment programme). 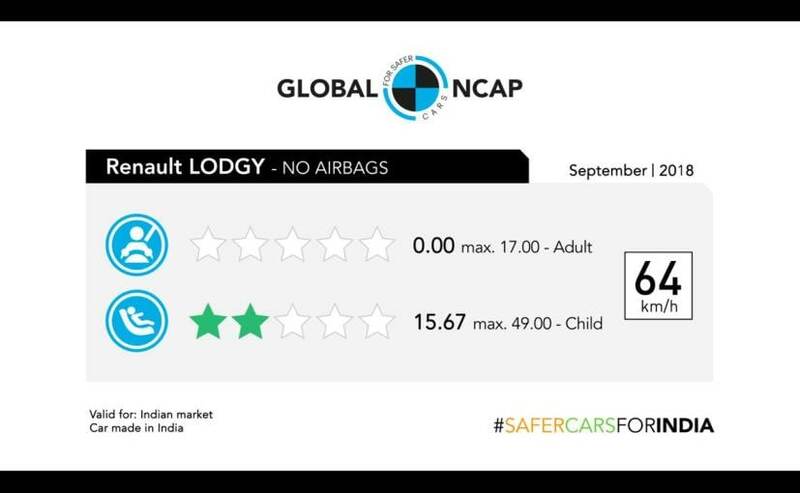 The crash test is a part of Global NCAP's 'Safer Cars For India Campaign,' in which the Lodgy scored zero stars for adult occupant protection, and an average two-star rating for child safety in the rear seat. 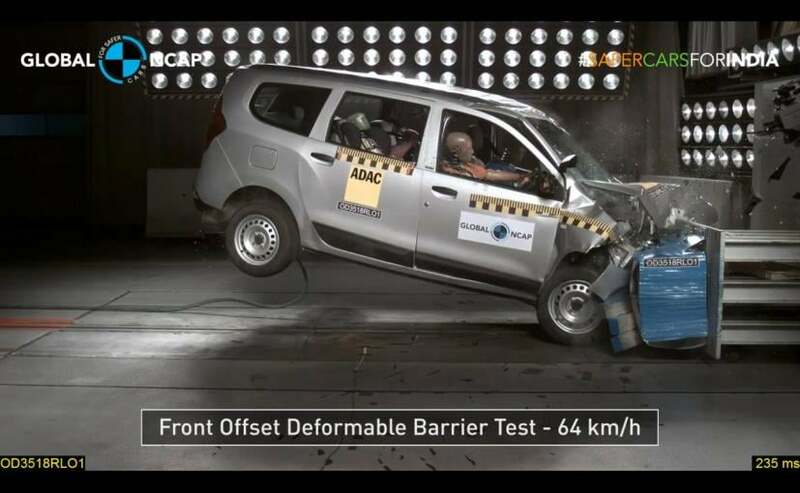 As with every other vehicle tested by Global NCAP, the Lodgy was tested at 64 kmph in the frontal offset crash test and sadly has showcased very poor results. The Renault Lodgy that was used in the crash test did not come with airbags nor did the MPV offer any kind of child safety systems like ISOFIX child seat anchorage. Sadly, Renault India does not even offer ABS (antilock braking system) as standard on the Lodgy, which further added to the MPV receiving a poor rating in the NCAP crash test. 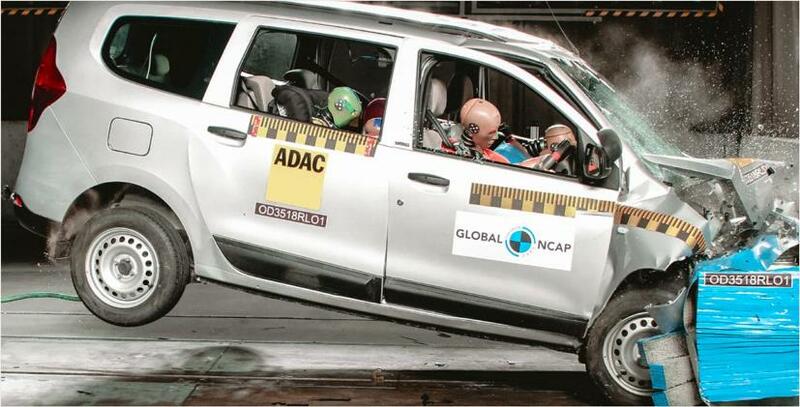 In addition to that, the Global NCAP has also rated the body shell of the Renault Lodgy as unstable. The test showed that driver protection, especially for the head, has been rated as 'Poor', mainly due to the impact that the driver-side crash test dummy's head had with the steering wheel, a clear outcome for not offering an airbag. The lack of even a driver side airbag also means that safety rating for other body parts like chest, and knee protection were also rated either 'Poor' or 'Marginal'. In comparison, the safety rating for the front passenger in the Lodgy, for head impact, was rated 'Good', which was mainly because of the lack of an object to have an impact with. Commenting on the Renault Lodgy's poor performance, David Ward, Secretary-General, Global NCAP said, "The Renault Lodgy is disappointing, I can't conceal that. Back 20-years-ago, Renault got a very good reputation under the leadership of Louis Schweitzer, who was then the CEO. (It) became the first manufacturer to get a whole string of five-star cars in Euro NCAP. Now, things are a bit different. I think this should be a wake-up call for Carlos Ghosn. I know he has a lot on his plate with running this big alliance with Mitsubishi and Nissan, but I think the days of Renault having zero-star cars, really, it's an embarrassment. I have a very clear message for Renault, across the whole range, they should have standard airbags for the front passenger and driver. No ifs, no buts, just do it." Clearly, the Lodgy is not the first Renault car to score a Zero-star rating in the NCAP crash test. Earlier in 2016, the Renault Kwid had also scored a Zero star rating, which a few months later was marginally improved to a One-star rating with the adding of a driver side airbag. Considering Renault did experience this in the past, the Lodgy certainly should have fared considerably better. Similarly, the Renault Duster also scored a Zero star rating without airbags, a score which was improved drastically to 3 stars with driver and passenger airbags added. Defending the safety levels on the Lodgy, Renault said that its cars met the safety regulations as prescribed by the ARAI. A statement from the automaker read, "All Renault products meet and exceed the regulations set by ARAI. Renault has taken great strides in vehicle safety. The company shares the goal of improving road safety worldwide, including the adoption of robust vehicle safety standards. Our products are ARAI certified, which is the current mandate in India. As India is gradually moving towards international safety and emission norms by including more robust regulations, Renault will be ready for the upcoming safety regulations and BS VI norms. The tests by Global NCAP are conducted at speeds that are higher than those prescribed by the regulatory authorities, not only in India but also in developed markets. The results of Global NCAP have to be seen in that perspective."